Increasing medical spa retail product sales can be one of the fastest ways to boost the profitability of your medical aesthetic practice. Focusing on product sales can benefit your medical spa in a number of key ways, and according to the AmSpa 2017 Medical Spa State of the Industry Report retail products account for 18% of total revenue at the average medical spa. Once you’ve decided that you want to make this a larger part of your business, where do you get started? When choosing product you want to make sure that what you are bringing in not only fits in with the brand direction of your business, but also that the products match the services you offer since proper use of a skin care program can produce better treatment results for your patients. You don’t necessarily have to stop at treatment products, however. A few on-brand retail pieces that don’t require a recommendation to buy can help create a more full experience for your customers. Are you a luxury brand? A wellness brand? You might consider dedicating some shelf space to items that reinforce this message. Though it’s good to have some selection of product in your medical spa, offering too many options at the same level of product treatment can be a detriment. Too many choices that aren’t differentiated can leave customers confused and less likely to purchase. Choosing a few lines that each have multiple levels of treatment will often serve you better. Major retailers know that engaging customers through multiple senses can yield benefits in retail sales. Visually interesting displays combined with calming music, or scents that match the scents of some of your products provide subtle boosts for retail sales. She emphasizes concrete expectations, measureable goals, sales systems, and team coaching when setting up a business for retail success. It’s also important to incentivize your team. 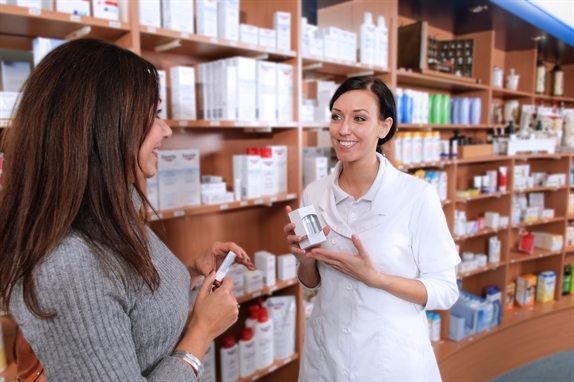 While, in most states, you generally cannot pay staff commission for services in a medical spa because of fee splitting laws, you are generally allowed to pay percent commission on retail product sales. Selling product is one of the keys to increased profitability in medical spas, and if you’re looking to get into the industry it’s a core principle you need to be familiar with. For more information on ways to build and run a successful, profitable, and legally compliant medical spa attend one of AmSpa’s Medical Spa & Aesthetic Boot Camps and be the next med spa success story. Med spa patient loyalty and retention is one of the biggest concerns among med spa owners, according to the 2017 Medical Spa State of the Industry Report. The report also states that fully 55% of medical spa practices have instituted some sort of membership program. 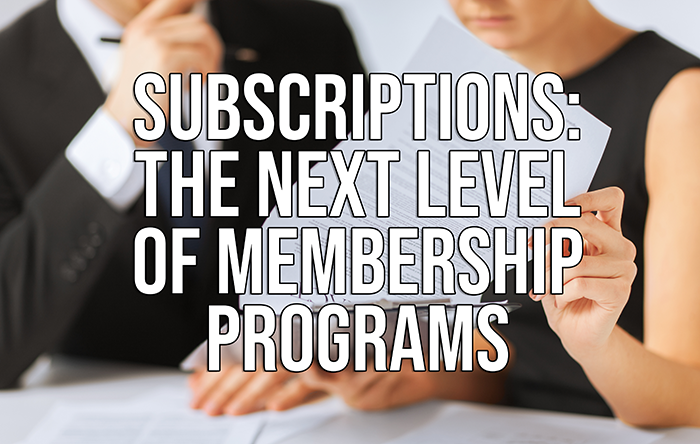 Paid membership programs can be a valuable tool to increase customer retention as long as you are keeping up your standard of care, and these programs can also be a huge help in gathering operating capital up-front and projecting future income. “This membership model built Skin Body Soul,” says Brandon Robinson, founder of Skin Body Soul Spa. Robinson believes that paid memberships help to bring in patients that are willing to commit to the spa as much as the spa is committed to the patients. Subscription billing for products flips the traditional product purchase model on its head. Rather than purchase a product, consumers purchase the right to use the product. Netflix and Spotify embody the power of this business model. With the success of the subscription billing model for products, the question becomes whether this model can work with professional services. The aesthetic industry has seen a shift toward providing non-invasive services on a subscription basis. HintMD, a technology startup based in Silicon Valley, developed a dynamic subscription platform to enable medical aesthetic professionals to offer their services via a subscription offering. Our law firm, ByrdAdatto, has offered legal services on a subscription billing model for several years to our larger clients, and in January 2017, our firm expanded the subscription billing model to provide access to our smaller business clients as well. The adoption of this subscription business model by our clients far surpassed our expectations. The goal with ours was to provide options for our clients in choosing how to pay for legal services. A little over a year since the roll-out, our Access+ subscription billing platform now represents close to 50% of our monthly revenues. The subscription billing model does not replace the need to provide excellent services; rather, it emphasizes the need to deepen the relationship with clients. Defining the scope of covered services becomes imperative. Key performance indicators to measure the success of your business dramatically change. Plan your cash management in the transition process. Subscription billing is not for everyone, so proceed with caution before completely switching to this billing platform. If you believe you are ready to switch, but are looking for somewhere to start check out Ten Steps to Developing & Launching Medi Spa Memberships in the AmSpa Store. ByrdAdatto represents physician practices, dental practices, law firms, medical spas, and other professional services companies throughout the United States. AmSpa members can take advantage of an annual compliance consultation call with the firm. If you have any questions regarding your business model, need assistance with designing corporate structure, or merger and acquisition activity, feel free to reach out to us at mgire@byrdadatto.com or call 773-831-4692. Michael S. Byrd , JD, is a partner with the law firm of ByrdAdatto. With his background as both a litigator and transactional attorney, Michael brings a comprehensive perspective to business and health care issues. He has been named to Texas Rising Stars and Texas Super Lawyers, published by Thompson Reuters, for multiple years (2009-2016) and recognized as a Best Lawyer in Dallas by D Magazine (2013, 2016). 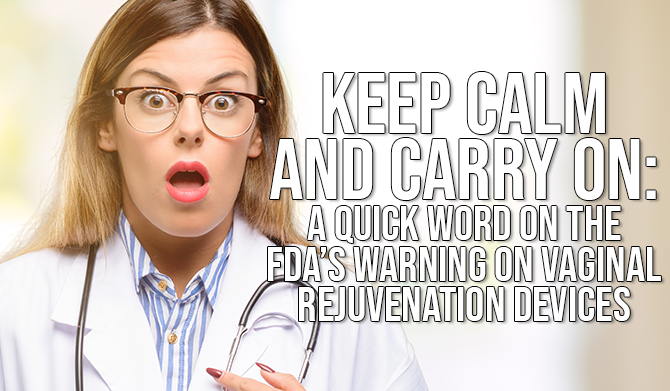 The recent warning by the U.S. Food and Drug Administration (FDA) to manufacturers of vaginal rejuvenation devices has caused quite a stir. And for some, the reaction has been closer to an all-out panic. Already, I’m hearing from concerned members threatening lawsuits, trying to return their devices, and demanding immediate refunds from manufacturers. Believe me, I understand. Had I purchased a device for several hundreds of thousands dollars, I would be alarmed by the warning, too. But as with many things in this industry, the reaction to the FDA warning may end up being more damaging than the warning itself. The ensuing panic and reaction could end up threatening a procedure that, by all accounts, is very safe, very effective, and enjoys unprecedented patient satisfaction. So, I’m here to reassure everyone and, hopefully, calm the waters a little bit. DONT PANIC! Keep calm and carry on as normal. This is not the end of the world, and I doubt very much that any medical spa or provider has anything to worry about, including those who continue to offer these procedures. The bottom line is this: vaginal rejuvenation is 100% legal for medical spas, and any physician can recommend and delegate the procedure using any of the devices at issue. This is called “off label” use of a medical device—using a medical device for a procedure other than what it is approved for by the FDA. This is done ALL the time. Botox, for instance, is not FDA approved for many, if not most, of the treatments it is used for. Indeed, most medical spas, surgeons and cosmetic derms are offering Botox injections off-label every single day. So long as the physician determines that, in his or her medical judgment, the treatment is appropriate and safe, these procedures can and should continue. There is no danger for medical spas here. The FDA doesn’t even have jurisdiction over medical spas or providers, so even if it wanted to do something (which it doesn’t), it couldn’t. There truly is no need to panic. AmSpa members with additional questions about the warning can take advantage of their annual compliance consultation call with ByrdAdatto. There are some things that all medical spas and providers should do, however. This warning is much more about marketing and advertising than it is about the actual treatment. All the FDA is saying is that manufacturers need to ensure that they are not marketing these machines for anything other than that which they are formally approved for. That’s it, nothing else. The FDA wants to ensure that the public, including medical spas, is aware that they have not approved these devices for things like tightening, dryness, or incontinence. That doesn’t mean you can’t use them for those conditions; it only means that the manufacturer cannot market their devices for those conditions. Keep a close eye on your marketing material so that you are clearly explaining what you are offering is an “off label” treatment. Just be honest with your patients. Education is key. Like with Botox, medical professionals who are within their state’s legal scope of practice to perform these procedures are still OK to do so. Thus far, this practice has proved to be quite safe. I highly recommend that you listen below to the recent podcast we hosted with attorney Jay Reyero of ByrdAdatto Law Firm as he gives some great perspective—and advice—on this issue. Also, stay tuned for more as we’ve reached out to the FDA and are trying to get them on a podcast as well. Remember: AmSpa is here for you! Subscribe on iTunes to be the first to hear new episodes. 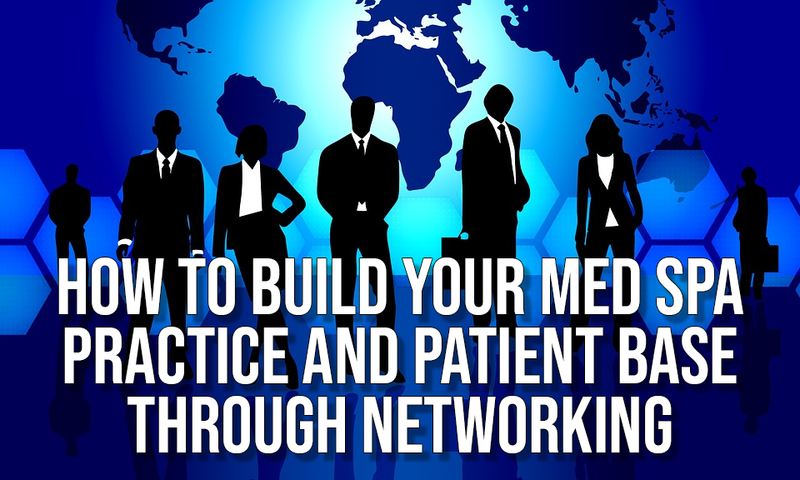 One of the most underused med spa marketing and business-building tools is also one of the oldest: Networking. Networking is a reciprocal process based on the exchange of ideas, advice, contacts and referrals. It is a social activity that most of us do every day as we exchange information with others. To turn a casual networking process into a valuable resource, however, it is necessary to “systematize” this process. By attending networking meetings, you can broaden your networking base while maintaining a high quality of contacts with professionals who are enthusiastic about networking. Making and maintaining professional relationships is essential to career growth, regardless of whether you own your own business, or are employed as a service provider. Networking is an important, invaluable and essential activity for every professional that can help you both get new ideas and solve challenges in your business, but also serve as a funnel for new patients. Trade notes and share ideas with medical spa professionals just like you at The Medical Spa Show, February 8–10, 2019, at the Aria Resort & Casino in Las Vegas. AmSpa members can also join the members-only Facebook group to get real insight from other owners and practitioners from across the country. If you are not doing anything about networking right now, it is likely that you are curtailing your prospects and ultimately harming your business opportunity. In general, the idea of interrupting a day’s workflow to entertain a client over lunch is becoming less popular. Business professionals rarely have time for a full sit-down lunch meeting in order to network and continue building business. Some business pros are setting up walking meetings and or networking spin classes. They’re finding active meetings to be much more productive because you can’t be distracted by your phone or laptop. The trend of Sweatworking is certainly more common among tech or media companies, where employees tend to be more willing to stray from tradition. Even on Wall Street, however, today’s business lunches pale in extravagance compared with the meetings bankers held before the recession. Many businesses are becoming more image-conscious and, along with that, more cautious about appearing wasteful. There are many different networking groups empowering and motivating people who want to expand the possibilities for generating business. Getting the maximum benefit out of networking requires effort and motivation, and each provider must take responsibility for their own progress. It is important that your motivation does not dissipate once you are enjoying many successful business relationships. Relying on an established network is dangerous as any network will tend to shrink over time due to relocations, job changes, deaths and retirements. If you are not adding contacts on a regular basis and actively trying to expand your network it will naturally diminish. Joining any new group of people can sometimes be a little scary or intimidating, but remember that this is a natural feeling for everyone. The important factor is to get out there. Everyone in the group you are visiting was a new member at one time and felt the same way. They are going to look forward to seeing you because of how many clients you have coming to visit you who are possible referral sources for them. Though networking vastly enhances your odds of receiving positive responses, building rewarding relationships can take time. You may be lucky and develop a strong and lucrative relationship with the first person you meet. It may take you several meetings with different professionals before you find someone you are comfortable developing a relationship with. Building trust in a relationship takes time and requires follow up with the professional concerned and the clients you refer to that professional. This establishes trust with the person who will remember that you cared enough to call and provides you with invaluable feedback on the business practices of that professional with whom you are building a relationship. Networking is a powerful way of building professional relationships and generating new business opportunities. The more relationships you build, the more you increase your referral network, bolster your reputation, and improve the quality of your client base. Follow these 10 steps to choose the networking group for you. 1. Research the groups in your community. There will be several types of networking groups that will have different ground rules for how they are run. For example, a group like BNI or Le Tip can only have one member of a specific profession in their group. If you are an aesthetician and admitted to this type of group you will be the only member in that category. 2. Choose groups that meet at times that are realistic with your time schedule. Your ability to be there consistently is essential to your success. If you are not a morning person and have difficulty getting up and going, perhaps a lunch time leads groups or an after-work gathering is a better choice. Showing up consistently is essential in building the relationships that will help in growing your business. 3. Try before you buy – Visit your perspective networking groups a couple of times before you decide to join. Get a feel for the people who are participating. Look how the group is organized and functions. Make sure this a match with your personality and objectives. If the group is filled with very conservative businessmen and your target is creative stay at home moms, that may not be the best fit. You must be comfortable in being able to effectively get your message across to members who can relate to your perspective and get excited to pass referrals. A final note: Watch how many qualified referrals are passed. This is the standard to measure the group by. If there are not a lot being passed this could be a sign of their ineffectiveness. You are there to build clients not just to socialize. 4. Prepare a sixty-second commercial. Let people know who you are and what you do. Make sure to be specific about what it is that you do and what types of referrals you are looking for. The best sixty-second commercials tell a story. People love to hear stories and are much more apt to listen attentively to you. Story telling takes practice, so do not worry you’re not perfect the first time out. Share examples of how you work with your clients, the attention to detail you give with each service and what makes you or your services unique. 5. Create a defining statement. A defining statement is shorter version of your sixty-second commercial. This is something that can be said in fifteen seconds or less. A defining statement should include two distinctions about you and your business. Remember people only buy for two reasons. They buy solutions to challenges or buy into good feelings; your defining statement needs both. Example Stylist: I provide easy care and low maintenance hairstyles for men and women. Example Aesthetician: I help people to have clear complexions and radiant, youthful looking skin. 6. You must give to get. The surest way to get referrals from your networking partners is to give them referrals. Create a book with the business cards of all your networking-partners inside. Really listen to the needs of all the people you meet. It is amazing when you are listening in this way how many requests you will get from people who need goods or services in the community. When you make referrals, you become a knowledgeable source of information for your clients to turn to. Help people achieve their goals and they will help you to achieve yours. 7. Get to know your networking partners. The key to successful networking is to build relationships with each member in your group. This takes time and your best efforts will come from setting up one– on–one meetings with your group’s members. Set up a lunch date or get together for coffee so you can discuss specifically how you can help each other. Come to your meeting prepared. Have a list of questions you can ask so you can get clear on how you can support them in referring their ideal and best client or customer. Once you have gathered information from them share the same distinctions about you and your business. The more precise you are the more likely you will help them and yourself. • How long have you been in your profession? • Tell me more about the products and services you offer. • What makes your product or services unique? • What distinguishes you from other professionals in your field? • Who has benefited most from your products or services? • Who is your ideal and best client and why? • What questions can I ask prospective referrals to qualify them for you? • Where do you find most of your best referral sources? • What is one action I can take on this week to help you grow your business? 8. Participate in networking training. Most networking groups such as BNI or Le Tip having networking training or mentoring available. Take advantage of this because it can support you in being more effective in other larger group situations such as your local chamber of commerce where they may not have this opportunity. Not everyone is a brilliant networker or communicator right from the start. Many groups will walk you through the process of creating a dynamic presentation and how to specifically ask for your ideal and best client. Learn from experienced members of your group or within your community. Do what other successful individuals have done and you will realize the same results. 9. Know the difference between a lead and a referral. There is a BIG difference between a lead and a referral. A referral is where one of your networking partners has found someone who has a need for your service, done some qualifying of the prospect for you, given them your information or business card and told them that you will follow up with a call. When you call, they know who you are and are open to doing business with you. A lead is where someone gives you a name and says “I think this could be a good source of clients” but has not spoken to a person specifically about you. When you make contact, you are calling cold, which means you are doing all the groundwork. It is much more powerful to have someone else sell your products or services’ features and benefits. Carry your cards with you wherever you go. You never know when the perfect opportunity will arise and gain you additional business. Bryan Durocher is the author of Wakeup Live the Life You Love in Beauty, and is the founder of Essentials Spa Consulting and Durocher Enterprises. Durocher was named one of the “Top 20 People to Know in the Beauty Industry” by Global Cosmetic Industry magazine, and provides coaching, consulting, global industry trends, and marketing solutions for medical spa, spa and industry professionals internationally. He has published many articles and has provided business education internationally at a variety of national and international industry events including AmSpa’s Medical Spa & Aesthetic Boot Camps and The Medical Spa Show. Are Botox Parties Legal? Are They Worth It? 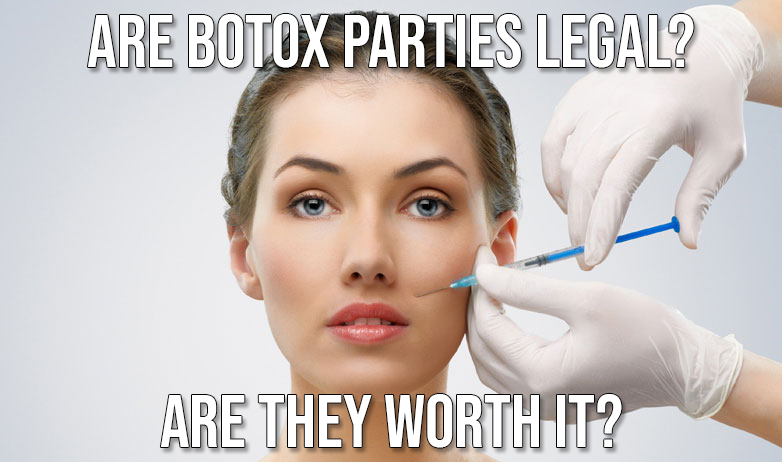 Botox parties are a common topic in med spa law because of how lucrative they can be, but are they legal? One thing I love about the med spa industry is that med spa owners and providers are continuing to innovate. The ideas that come from AmSpa members on marketing, branding, and business always leave me impressed. This is one reason why it is so difficult to keep track of what’s legal and what’s not - many of the ideas we are asked about are brand new. They’ve never been tested before, and therefore it’s difficult, if not impossible, to determine where the legal constraints are. While not new, Botox parties are an innovation like this. These are events hosted by a med spa or a provider, either at the med spa or another location, where people get together to socialize, learn about treatments, and try new treatments. Often the med spa provides discounts on product so that they can get new patients in the door. Often alcohol is served. These are highly social events that mix pleasure with aesthetics, which makes the idea of getting injected with a needle a little more palatable. A question I get all the time, though, is whether these events are legal, particularly when they are held outside of the med spa (at someone’s house or a salon). And the question that always follows - is it worth it? The answer to both of these questions is yes - it is absolutely legal (in most states - sorry, Nevada*), and it is ABSOLUTELY worth it. But like most things in this industry, both of these answers are dependent upon you adhering strictly to the law. No amount of money is worth losing your license, and, yes, I have seen nurses lose their licenses because of improperly hosted Botox parties. AmSpa members can check their medical aesthetic legal summary to find the law regarding Botox parties in their particular state. The primary point to remember is that when you provide any medical treatment off site all the same rules apply. New patients must be seen by a doctor, nurse practitioner (NP), or physician assistant (PA) prior to being treated. Proper records must be kept. Consents must be signed. Before and After photos should be taken. Everything that you are required to do legally in your med spa should be done at the Botox party. Additionally, check with your insurance carrier before the party to ensure that you have coverage for offsite treatments, and double check local ordinances regarding serving alcohol - sometimes a permit is required. The biggest risk at Botox parties, or any social event involving med spa treatments, is that a patient will be treated by an RN without first seeing the doctor (or NP/PA). All patients must be seen first so that a plan can be set. This can ONLY be done by an MD, or by an NP or PA operating under proper authority. Indeed, even if the patient consents to being treated by the RN without first seeing the doctor, that does not allow the RN to inject the patient without the patient first seeing a doctor. At Botox parties this can be difficult because there are new patients socializing, there is sometimes alcohol being consumed, and everyone is more relaxed. This is a step that MUST be followed, though, because an RN cannot practice medicine, and therefore the RN cannot legally perform the initial assessment, establish the physician-patient relationship, and set a treatment plan. There are no exceptions to this rule. Equally as important is obtaining patient consents, including privacy waivers given that treatments are usually performed out in the open. And providers should be mindful of patients consuming alcohol. While not strictly illegal, we all know that alcohol makes people less inhibited and often clouds judgment. This is NOT good when it comes to patient consent. All patients should offer consent before they begin drinking, and the drinking should be kept to a minimum. This is not always easy, but trust me, if there’s an adverse outcome you’ll wish that alcohol was not involved. Also be mindful of photos and social media. These events are a great way to market your med spa - people are having fun, everyone is happy, and you remove much of the clinical aspects of aesthetic medicine. Be careful, however, when photos or videos are posted - every patient is entitled to privacy, and if any patient has failed to sign a privacy release and an authorization to use their photos, there is a risk of a breach of patient privacy. So the fact that these events are legal begs the question - is it worth it? The answer is emphatically yes, provided you strictly adhere to legal guidelines. Botox parties and social events are a great way to get new clients introduced to your practice, pre-book treatments, and bring in some cash. To get started setting up your own events check out the Secrets to Successful Event Planning in the AmSpa Store. The usual protocol is to offer discounts on treatments and pre-bookings (both for injectables and laser packages), provided they are purchased that night. Patients are encouraged to bring friends and colleagues to meet the providers and learn more about aesthetics. Depending on the size of the event, it is not uncommon for a practice to bring in six figures worth of treatments and bookings - in one day. Even that kind of money isn’t worth losing your license, though, so be careful and diligent with your compliance efforts. I urge you to move cautiously when it comes to planning and hosting one of these events. Do your homework and ensure compliance is in place. Go easy on the alcohol. Make sure you’ve got proper insurance. If you have any questions whatsoever, consult with a qualified lawyer ahead of time so that all of the proper documentation is in place, the needed personnel are available, and all the rules are followed. For more information on running your med spa legally and profitably, attend one of AmSpa’s Medical Spa & Aesthetic Boot Camps, and become the next med spa success story. *Nevada recently passed a law restricting the injection of Botox and fillers to a doctor’s office, essentially banning the ability to host Botox parties. The US Food and Drug Administration recently issued a warning to several device manufacturers regarding the marketing associated with “vaginal rejuvenation,” and the American Med Spa Association and the law firm of ByrdAdatto want med spa practices to understand how this relates to their day-to-day operations. Med spas and other health care professionals should not panic as the FDA will not be raiding their businesses. The FDA does not have any control over a physician’s ability to prescribe “off-label” which in this case would be when physicians are using the energy-based devices to perform vaginal rejuvenation procedures. 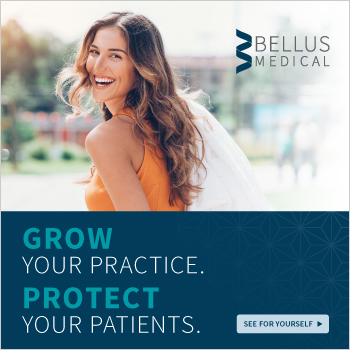 Although the particular devices are approved by the FDA, they are approved for a very specific use which is not the performance of vaginal rejuvenation procedures. What is important for med spas and other health care professionals to understand is that such “off-label use” is subject to the oversight of their medical boards. Therefore, med spas and their medical directors that are performing vaginal rejuvenation or are interested in providing vaginal rejuvenation should take this opportunity to review how they are or will be performing these procedures. Not only should the physicians or medical directors responsible for performance of the procedure be properly trained and qualified for it specifically, but they should also have a good understanding of any available scientific and clinical data relating to the procedure in order to, in their professional judgment, determine it safe for patients. In addition, they also need to confirm they are meeting the supervision required of those health care practitioners providing the medical services. Finally, they need to ensure patients are being fully informed and understand the risks about the procedure and that all information communicated satisfy state medical board rules and laws, including those relating to advertising. More more information on this topic listen to the episode of AmSpa's Medical Spa Insider podcast detailing the issue. 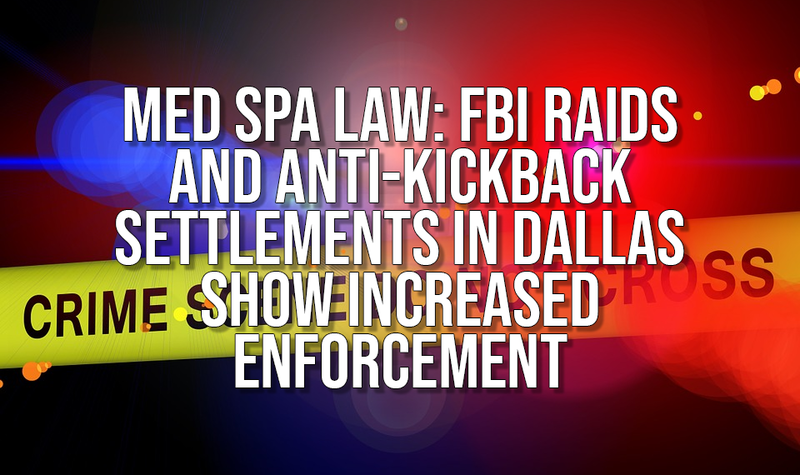 Legal enforcement has been a big topic among med spas across the country recently, and that includes Dallas. During the last 12 months we have covered a wide range of articles on significant litigation by the government and the commercial payors challenging how providers submit bills. The allegations have ranged from completely fabricated bills to overpayment of fees for out-of-network services. The civil litigation has involved United Healthcare’s allegations against Next Health, LLC for engaging in fraudulent activity, Quest Diagnostics’ settlement of a whistleblower lawsuit; and Blue Cross Blue Shield of Mississippi’s suit against a community hospital alleging it violated its contract for overpayment and recoupment of claims. This May, the Dallas area health care industry had two new breaking enforcement stories. The Dallas Morning News reported on an FBI raid at a Dallas-based healthcare management company. The FBI has not provided any insight as to the reason for the raid, and the company has denied any wrong doings. That same week, the Dallas Morning News broke a separate story of federal authorities settling a civil suit with a physician for allegedly being paid kickbacks by a Dallas-based lab. Federal authorities believe that the lab used a “sham investment model” to make payments for blood and urine screens. The lab was not a part of the settlement agreement, and no allegations have been made against it. For more information on your state’s laws and regulations, attend an AmSpa Medical Spa & Aesthetic Boot and be the next med spa success story. Brad Adatto, JD, is a partner at ByrdAdatto, a business, healthcare, and aesthetic law firm that practices across the country. He has worked with physicians, physician groups, and other medical service providers in developing ambulatory surgical centers, in-office and freestanding ancillary service facilities, and other medical joint ventures. He regularly counsels clients with respect to federal and state health care regulations that impact investments, transactions, and contract terms, including Medicare fraud and abuse, anti-trust, anti-kickback, anti-referral, and private securities laws. Does your med spa website meet all your local laws and regulations? According to the 2017 Medical Spa State of the Industry Report, a website is the most frequently used marketing tool for med spa practices. If you don’t have one, you’re losing out. A very common mistake being made by med spas across the country, however, is the failure to create and maintain a website that accurately reflects and realistically represents the business structure and ownership of the med spa. Due to recent substantial growth in the med spa industry, regulatory authorities in several states are cracking down on med spas that are, or appear to be, operating illegally. But just how are these state regulatory agencies obtaining information on the business operations and workings of med spas? And what information is leading investigators to believe a med spa is operating illegally? Websites. Technology and social media has driven businesses, big and small, to use the Internet as a tool to provide information to their clients. 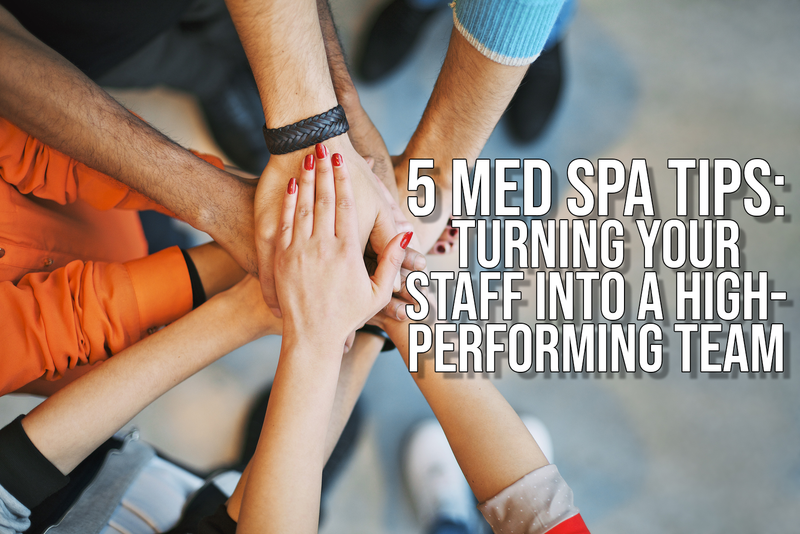 Med spas are no exception. A majority of med spas across the county operate websites with information about their “team” of professionals, the services provided, specials and discounts offered and even explanations of the different treatments and procedures clients can purchase. Many of these websites provide bios of the professionals that own and operate the med spa and perform medical procedures. But, unfortunately, in several instances those individuals are not licensed to practice medicine and thus, cannot perform medical procedures or own a medical practice. State regulatory authorities have caught onto this- and now they are enlisting investigators to examine med spa websites looking for signs of illegal ownership or the unauthorized practice of medicine. For instance, in Illinois, the Department of Financial and Professional Regulation (“IDFPR”) has begun launching investigations against med spas based solely on their website content. (AmSpa members: check your state’s medical aesthetic legal summary for more information on medical advertising in your state.) The IDFPR, much like other state regulatory agencies, has an enormous case load and it is impossible for investigators to personally visit every med spa to investigate and determine whether the spa is in compliance with state laws. Instead, to save time and effort, investigators are tasked with reviewing the websites of med spas to obtain information on ownership, business structure, fee structure, staff qualifications, and services. If the med spa website does not realistically reflect its business practices or falsely depicts a non-physician as an owner or co-owner of the med spa, it will quickly be on the IDFPR’S “radar” and the owners and employees associated with the med spa can face suspension of licenses, fines and penalties. Click here to read more about non-physicians owning med spas. Although not all states have prohibitions against non-physician ownership of medical spas, most states prohibit fee-splitting between physicians and non-physicians. If a website advertises ownership by a non-physician and highlights a physician as a “medical director” for the med spa, it is likely that the non-physician owner is receiving patient fees and then splitting these fees with the physician on staff. This constitutes fee-splitting between the physician and the non-physician owner of the med spa and it is illegal. Importantly, if employing a registered nurse or aesthetician as the med spa’s “go to” coordinator or office manager, bestow upon the individual a title that properly reflects his/her duties, responsibilities, and limitations. As technology grows, websites and other forms of social media become increasingly important for med spas looking to grow their business and compete in the marketplace. 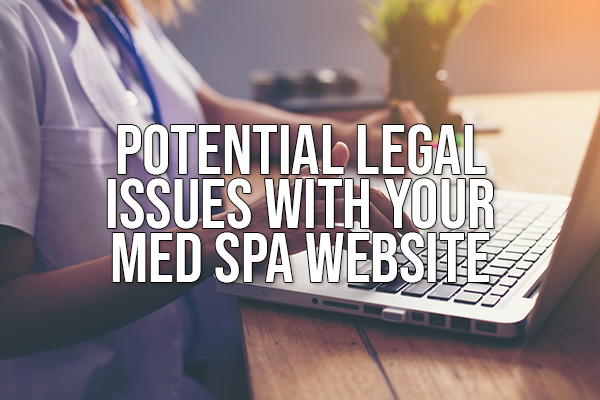 Now is the time to reevaluate your med spa’s online presence and ensure that if you have a website, or plan to establish one that you are conforming to the law and using the website to help, not hurt your business. To learn more about how to build and run a legal and successful medical spa practice attend an AmSpa Medical Spa & Aesthetic Boot Camp and be the next med spa success story. Having an outstanding team in a medical spa or aesthetics practice is one of the biggest contributors to long-term success. Quality employees will impact everything from treatment results, to patient retention, to new patient acquisition, to retail sales and much more. Every person working at your aesthetics practice plays an important role—from a full-time nurse injector to a part-time marketing intern. Boosting performance is always a priority, but it’s not always clear how to navigate the hiring, training, and team-building process so everyone is ready to keep your practice running smoothly and your customers feeling great. If you’re wondering how to build a high-performing aesthetics team, then we’ve got you covered with these five key tips to hiring and training high-performing staff for your practice! Begin your team-building project by realistically assessing the number and character of distinct jobs that your practice needs to succeed. Your goal is to have the right number of people to serve all your clients without long patient waits. If practice is on the smaller side, the team might be made up of yourself, a direct treatment provider (maybe that’s you, maybe that’s another person), possibly an aesthetician or injector, and a receptionist. 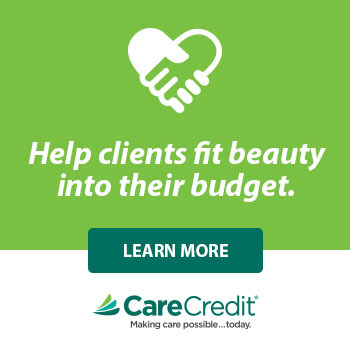 A larger practice might add multiple aestheticians, a medical director, a medical assistant, a practice manager, a care coordinator, and a marketing associate. To build a high-performing team, be patient with the hiring process—adding a weak member to the team will hurt morale and hamper the patient experience. Think about the kind of personalities and credentials that you’d like to join your team. Articulate the top priorities for a potential new hire. These could be professional skills, team style, leadership, customer service, or other qualities. Those key priorities are your guide through the hiring process; when it comes time for the interview, translate them into questions, and tailor them to fit the responsibilities of each role. Those questions will illuminate how the potential hire rates on the key attributes you identified, and indicate whether or not they’ll be an asset to your team. The key to fostering a positive atmosphere? Lead by example! Greet each staff member each morning when you arrive, and say goodbye each evening before you leave. Arrive on time and show empathy. After all, this group spends around 40 hours together each week. Making those relationships meaningful will strengthen your team and your practice. If you create a workplace environment where employees are genuinely happy, patients will feel it, too. Another important element to building up your team’s professionalism and dedication is ongoing training, and training can happen in a lot of different ways! Schedule a weekly half-hour training session or an afternoon of training once a month. If you use aesthetic devices, look for manufacturers that offer ongoing clinical education, so employees can use these devices to the best of their ability. Building employee expertise enhances your practice overall, so keep your staff up-to-date on industry trends and new procedures. Creating and maintaining a high-performing team for your aesthetics practice may be simple, but it certainly isn't easy. It requires commitment on your part. It's difficult to create or sustain a healthy team environment if employees do not feel protected or valued in terms of payment or support for their labor. Start with strong fundamentals like fair wages and realistic benefits, and ensure that these are taken care of before all else. Be consistent and be equitable, and make sure that your bases are covered from day one in terms of fair pay and labor practices. Still unsure about where to start and how to make the best impact? Don’t worry! Venus Concept partners with high-performing medical aesthetics clinics in more than 65 countries, and has developed a report specially designed to help your practice succeed. Download the free report, How to Create (and Maintain) a High-Performing Team for Your Aesthetics Practice, to learn more about what makes a great aesthetics team. 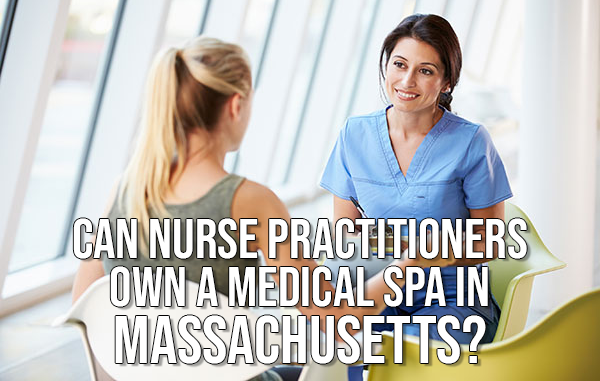 Can Nurse Practitioners Own a Medical Spa in Massachusetts? The question of who can own a med spa is always one of the most common with medical aesthetic practices, and in Massachusetts it can be a tricky one because of the nature of the laws in the state. Massachusetts is one of a few states that has a clinic licensure statute—a comprehensive regulation that outlines a process by which a person or organization other than a physician or a physician-owned company can own a health care facility, such as a medical spa. In the past, we at AmSpa and ByrdAdatto have worked with companies in the commonwealth to obtain clinical status for their businesses. However, approximately a year ago, we were informed that in some cases, this process may not be necessary. When ByrdAdatto reached out to the Department of Public Health, it was told that in the opinion of the department’s legal counsel, an NP does not need to obtain a clinic license to own a medical spa. However, since this was merely the opinion of one person, the firm felt uncomfortable telling clients that such a course of action was legally sound. As it stands, though, this issue may be moot, because Massachusetts law states that NPs require physician supervision in order to have a prescriptive practice. However, Massachusetts Senate Bill S.1257, which is currently in committee, would, if passed, remove the requirement for physician supervision for an NP prescriptive practice. If this bill passes, NPs could theoretically operate a practice completely independently of a physician. This, in turn, raises some questions about how an NP who owns a practice would be able to market it—is it really “medical” if there’s no physician involved?—but these are issues that will need to be addressed when and if the bill passes. For more information on medical spa law attend AmSpa’s Medical Spa & Aesthetic Boot Camp in Boston September 15–16 where you’ll learn the keys to build and run a legally compliant and profitable medical spa practice. See the full 2018 Boot Camp schedule to find a Boot Camp near you and be the next med spa success story.